ShaBot ShaBlog: Can you tell me how to get to Washington, D.C.? Can you tell me how to get to Washington, D.C.? 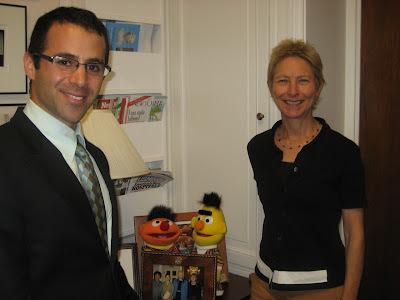 Writers from “ Sesame Street ” and WGAE staff held meetings in Washington D.C. to advocate for increased funding for public broadcasting. On Thursday, July 23, “ Sesame Street ” writers Judy Freudberg and William Levin, along with “West Wing” and “Without a Trace” writer Allison Abner, accompanied WGA East staff to advocate for increased funding in public media. The members of Congress we met with, including Congressman Steve Israel (D-NY) and Congresswoman Nita Lowey (D-NY) both from the House Appropriations Committee, have already allocated a 10% increase in funding the Corporation for Public Broadcasting, which is great news for our members. Furthermore, they both expressed interest in potentially getting involved in our current contract negotiations with PBS. Overall, this was a very productive endeavor. The Guild looks forward to taking similar trips to D.C. in the near future. 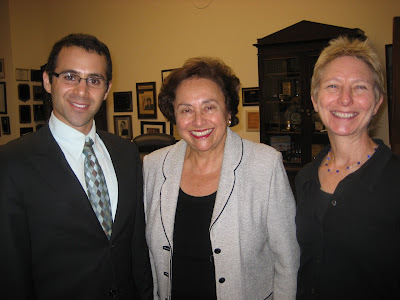 Congresswoman Nita Lowey happens to be a big fan of Sesame Street!